Car Insurance Tracker, What is one? A car insurance tracker is more commonly known as a Thatcham Approved Tracker. Thatcham is to vehicle security what corgi is to the gas industry. It sets out the guidelines, criteria and benchmarks for car trackers to meet. Once they meet these they are then certified for use as car insurance trackers. 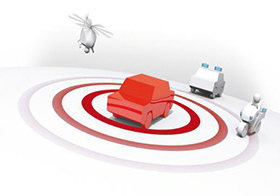 A car insurance tracker is a small device which is installed covertly into your vehicle, constantly monitored by a secure control centre who can communicate with the unit to reveal its location on demand 24 hours a day, 365 days a year, anywhere in Europe, and in the event of theft track its location in real time. Primarily the vehicles battery powers it, should this be interrupted then the internal battery of the car insurance tracker will keep the device powered and immediately transmit a covert signal to alert to the control room. Part of the Thatcham criteria for approval of car insurance trackers is a requirement to be monitored 24/7 by a secure control centre. To do this they use an internal SIM card, this data transmission and monitoring requires an annual subscription to be paid. Generally cost between £138 to £168 for those that fall into the category 6 and £198 to £215 for those in the category 5 section. Car insurance trackers use a variety of methods to communicate their positions and information. These methods include GPS, GSM, VHF and GPRS. Different categories of car insurance trackers use a selection of each of these. You can see more about Category 6 Car Insurance trackers by clicking here or more about Category 5 Car Insurance trackers by clicking here. Car insurance trackers - why have one? With many modern cars now becoming keyless and running on digital CAN systems they are effectively computers sat on your drive. Many consumers often protect their desktop computer or laptop with antivirus software but do nothing with their car, as they are not aware of the flaws in vehicle technology leaving them vulnerable. Due to the digital nature of these vehicles thieves can simply plug in a computer to your vehicles OBD port (On Board Diagnostics port, used by the main dealer for servicing and installed in all cars since at least 2002). Once plugged in thieves can easily code a new key in minutes before driving away in your hard earned car. As digital car theft is so easy thieves will target many different vehicles as oppose to the obvious high end and high performance ones they used to. Many of these vehicles will then be sold on at a fraction of their value, used in crime, stripped down into parts of even sent for sale throughout Europe. All in all they can earn £0000's for just a few hours work. With car insurance trackers starting at just £189.00 supplied and fitted we now find more and more people choosing to have one installed. This is to a huge variety of cars, gone are the days where it was just Range Rover's, Subaru Impreza's and Mitsubishi Evo's having car insurance trackers installed, we now see anything from. Fiat 500's, VW Golf's, and people carriers through to vans, super cars and motor homes on a daily basis. Many car insurance trackers now have a FREE APP to allow you to see the position of your vehicle at any time, from any where in the world giving you fantastic peace of mind should you require it. Some insurance companies will apply a discount to your premium for having a car tracker installed; others require it as a condition of the policy and will not cover for vehicle theft unless proof of installation can be provided. The value of a car can often deem an insurance tracker a requirement as can the insurance group. We have a wide range of car insurance trackers to suit all budgets and requirements. These are all available for installation throughout Yorkshire by our fully mobile engineers at your home or work. Should you require any information for your car tracker, insurance Approved or not then please feel free to give us a call where we will be happy to provide free, unbiased and professional advice. Some of our most popular car insurance trackers are shown below. ✓ Thatcham Category 6 Tracker. ✓ Uses GPS and GSM to communicate with the added benefit of viewing the location of your vehicle from any web enabled device, allows journey reporting, geofence alerts, 1 minute live updates and more.